Does your dog experience anxiety? A lot of our pets get anxious around fireworks, thunderstorms and traveling, to list just a few. I know some people give their pets doggie Prosaic, but the Thundershirt gives pet owners an alternative. For centuries, parents have been swaddling infants to calm them. The Thundershirt does the same for you dog (and now your cat). After doing some reading, I would say that the gentle pressure that the shirt exerts causes the nervous system to release some type of calming hormone. Whatever the reason it works, the price of $40.00 seems like a good deal to me. My veterinarian, Dr. Cahill has a good video about Thundershirts. You can see a big change in Iccus, the Doxy the minute he gets his shirt on. I'm thinking about trying one for Dylan when we travel. 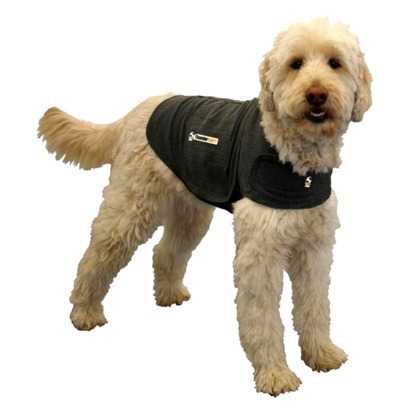 Thundershirts are available on line. Your veterinarian can also order one for you. Click here to go to Thundershirt's web site for more information.